So all of my research and thought have come down to this. I wanted to improve the existing Zen Cart checkout without altering core files. Here are my conclusions that I have incorporated into my newest mod. 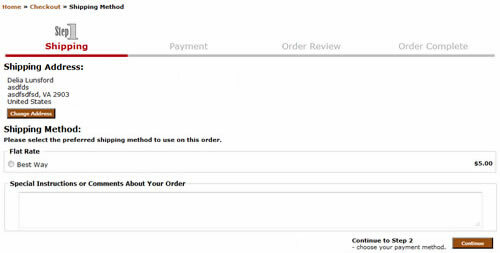 First, I took a piece of advice from Fast and Easy Checkout and Numinix.com. He recommends turning off the sideboxes for checkout – getting rid of distractions for the buyer and keeping that buyer on track to finish the process; i.e., completing the purchase. I’ve always liked the split login in page (a setting in admin/configuration/layout) but never liked the fact that it added another link into the process of checking out for new customers. So that page is now automatically a split page but with the create account on the left and the login form on the right. 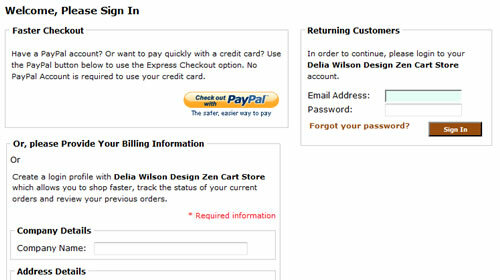 If you have Express PayPal activated for the checkout, the create account box appears below the Paypal Box which has been shortened and made into a Paypal box only. I changed the text for PayPal to emphasize that a PayPal account is not required. Borrowing from another mod, Checkout Without Account (COWOA), I took the visual cues further. Since COWOA changes core files and does create and keep account information (so you are lying to your customer), I’m not as big a fan of that as I might be. But there’s definitely lessons to be learned from it. I made changes to that visual header, bringing in more css and getting rid of the png images to make it more cross-browser compliant. 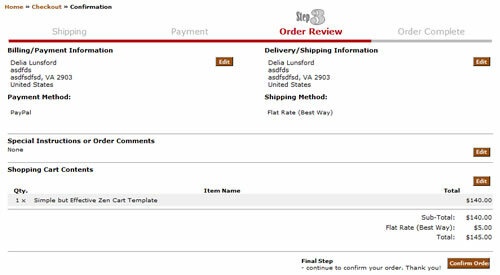 I changed the arrows to images that are better visual cues for where you are in the checkout process. I also changed the colors to red for a stronger contrast to catch the eye. I moved the continue to step test to next to the the continue button for greater clarity. I moved the change address button to underneath the address to get it closer and also removed some instructional text from beside the address. Though it helped to explain things to the customer, I felt it did more harm cluttering up the page. There are plenty of visual clues to the fact that it is the shipping address now. 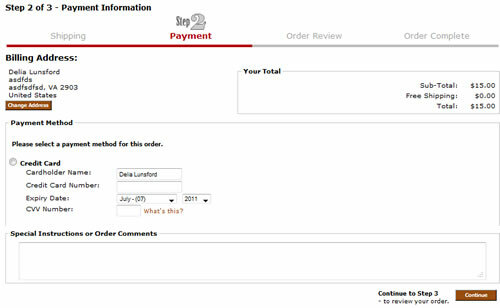 Carrying that on to the payment page, I moved the change address button (It was edit before) to underneath the address and allowed the order total box to flow up to the right hand side to be more easily seen I also changed the text next to the continue button to read continue to review instead of confirm as it also says that on the confirm page. 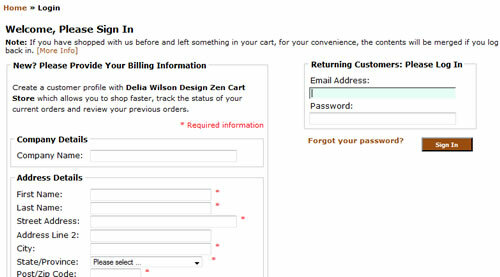 That’s a confusion that needs cleaning up in the default Zen Cart. Author: Delia Wilson Lunsford, Founder & CEO, WizTech, Inc. This entry was written by admin, posted on July 5, 2011 at 10:09 am, filed under Zen Cart. Bookmark the permalink. Follow any comments here with the RSS feed for this post. Both comments and trackbacks are currently closed.